Diagnoses student skill gaps according to logical pre requisites based on your state standards. Prescribes individual learning paths regardless of grade level automatically. Students work only on the objectives they do not know in a sequenced order and build understanding by linking together concepts within and across grades. Motivates students through award-winning online instruction and explorations for over 700 objectives. The Result: students work at their own pace filling gaps quickly. Most educators choose to have students attend Algebra Class while using Ascend Math in a second math elective, remediation block or at home. Students work on objectives online in proper sequence filling gaps quickly. They can pause and review instruction at any time and as often as needed. Instruction and explorations cover conceptual as well as algorithmic approaches to the objective. Students employ the standards of math practice and build mathematical literacy while working on robust manipulatives. Following instruction and practice students demonstrate mastery on a post assessment before moving on to the next objective in their individualized study plan. 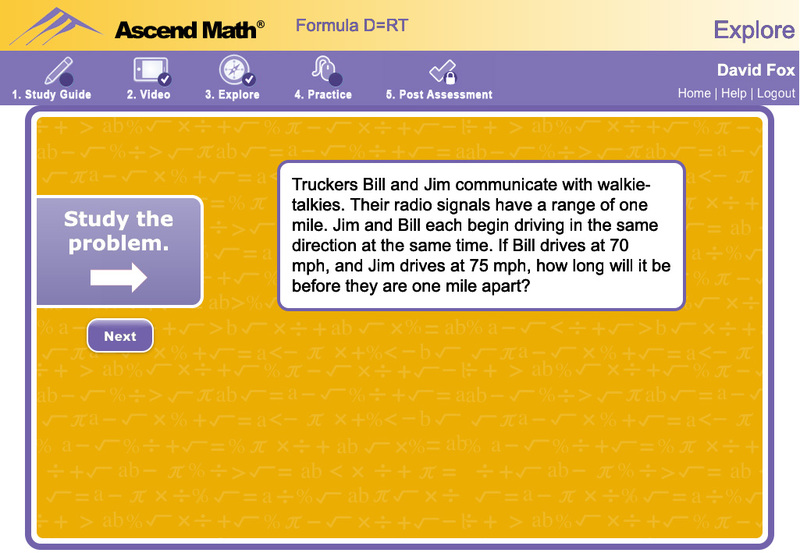 Click to preview an algebra lesson. 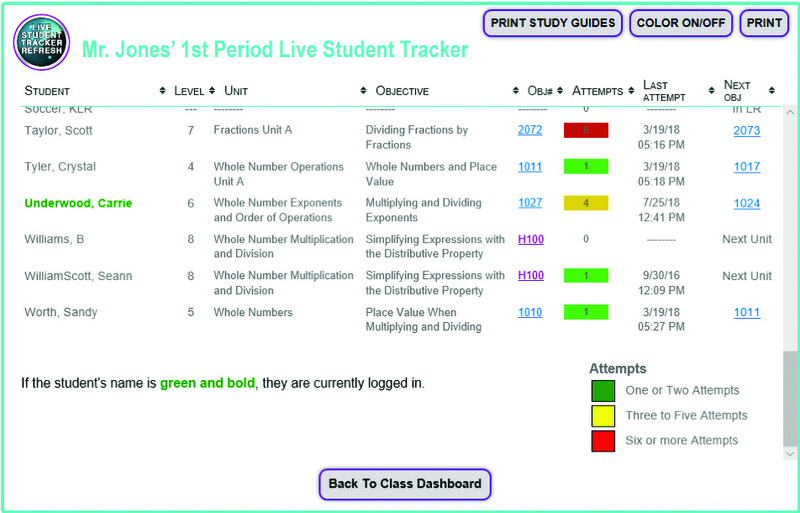 Live Student Tracker provides real-time information for each student in a class suggesting opportunities for small group instruction and informing teachers immediately if students are struggling and in need of intervention. Teachers can also see who currently logged in. Teacher Guides provide strategies to use Explorations in group instruction, give suggestions on additional project-based activities and allow students to model and practice what they learn. Teacher guides and study guides support Expectations for Literacy in Mathematics.